G21 Chamber horizontal presses juice instead of grinding and thus allows a much higher yield of fresh juice while maintaining all the vitamins, fiber and enzymes. 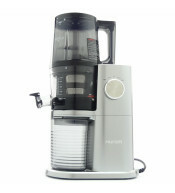 Compared to classical high-speed juicers, it prepares fresh juice in its purest form, full of healthy nutrients. 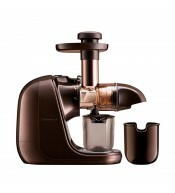 The Hurom H34 'One Stop' Cold Press Juicer uses a very low speed compression method. The juicer molds the juice instead of grinding and allows a much higher yield of fresh juice while preserving all the vitamins and enzymes. In contrast to classic high-speed juicers, fresh juice is prepared in its purest form of full-bodied nutrients.